Looking back I wonder, how come I did not make the Goan Chow Chow more often. It is the most easiest, kid friendly egg noodles recipe to make and very tasty. This dish is quintessential on the buffet table for all weddings and special occasion celebrations in Goa. As usual, when I get ready for my weekly blog I do my Google snooping and found only two recipes for Goan Chow Chow the remaining were for Chow Mein and each one was so different from the other that I felt the need to put out the recipe that was originally made before the Chow Chow got converted to Chow Mein with Chinese cuisine influence. If you search Chow Chow in Google according to Wikipedia it is a Dog breed originally from China. If you search Chow Chow Recipe then its a Southern Relish that is slightly tangy. That goes well with everything from hot dogs to corn bread and is a perfect way to preserve summer produce like bell peppers and green tomatoes. So if you ask me what is the significance of the Goan Chow Chow name, frankly I have no answer. 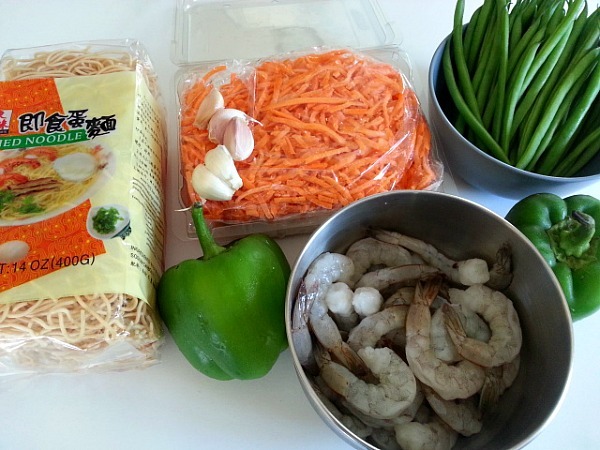 Wash the shrimps, add grated 3 garlic cloves and salt to taste. Keep the shrimps / prawns aside. Next cook the egg noodles al dente according to the cooking directions on the packet. Drain the noodles and add 2 tbsp of oil so as not to stick. In a non stick large skillet add a little oil and saute each vegetable separately and season it with a bit of salt and keep aside. Once all the vegetables are done saute the shrimps. Next smash with the back of your knife the remaining 2 garlic cloves and add it to the hot skillet with oil . Saute till browned to flavor the oil. Take it off and now add the noodles and saute well in the garlic oil. Next add the sautéed vegetables, shrimps/ prawns and season the mixture with the vegetable bouillon according to your taste. 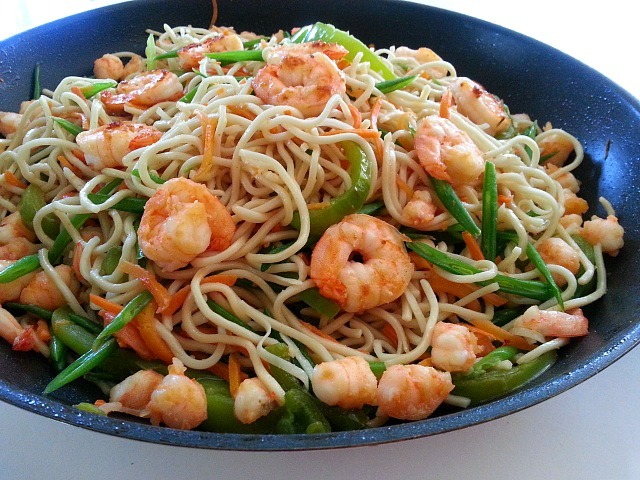 For a vegetarian version just skip the shrimps / prawns. 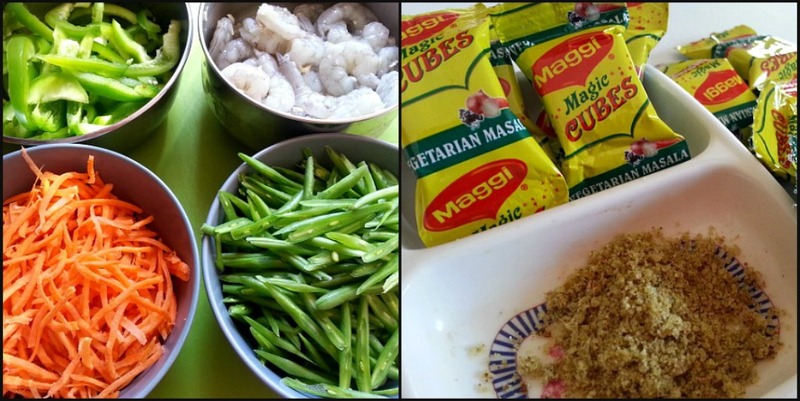 Here is the pictures for the Goan Chow Chow Vegetarian Recipe. Side Note : In some cases tomato ketchup is added to the noodles for added flavor. I should be able to cook this Chow Chow noodle dish myself. Looks delicious. Thank you. Carbs have lost favor in the diet industry recently, but did you know carbs are the main fuel source for cardiovascular activity? 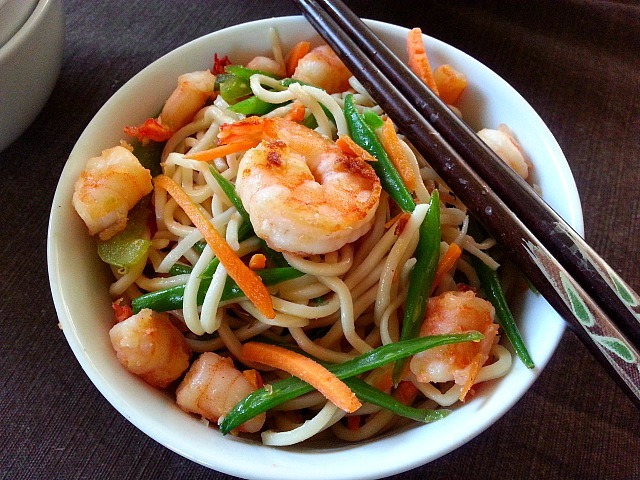 Treat yourself to this delicious noodle dish after a long hike or jog – your body will thank you! Thanks for the update will check it out. You always have such delicious healthy recipes. Love the name of this dish too. Also, I’m sure it’s perfect without the ketchup. Thanks a lot Nisha. I do strive to make my recipes healthy and at the same time tasty too. I too prefer it without the ketchup. Thanks Marko. You too have a great week. Looks delicious and simple! I’ll be sure to try soon! I think my little boy is going to love this! Great recipe! Sounds great (and looks amazing)! I have GOT to try this ! Love the brightness & zestiness of this dish! You make me feel like having a noodle feast!! 🙂 Wonderful pictures!!! I love this recipe, so fresh. I just can’t do egg noodles at the moment so will substitute rice noodles for now. I love your recipes. Keep them up. Thank You! 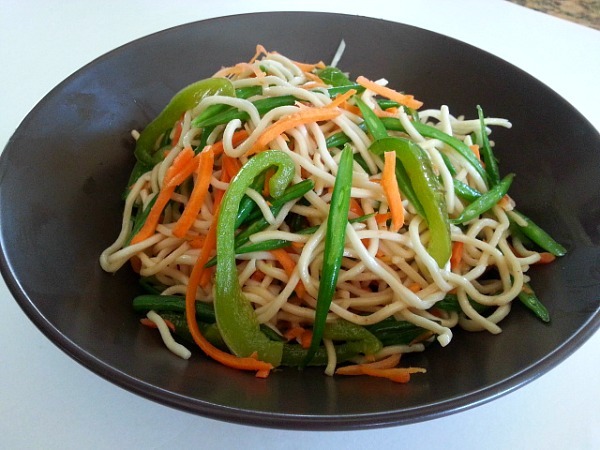 Yes it is a very light and refreshing dish with all the vibrant veggies. Rice noodles or if you like Japanese soba noodles will work. Thank You so much. 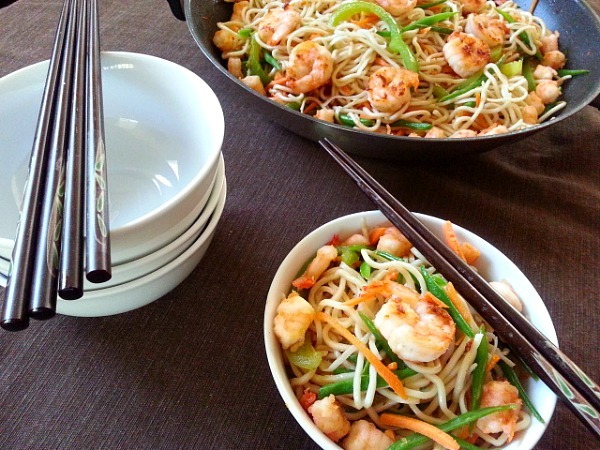 You sure can skip the shrimps and it turns out great. The flavor is from garlic and the smokey flavor of bell pepper. This dish looks very delicious. Thank you for sharing.